poly ships, and four high poly containers. Thanks. I've been working on this for quite awhile, and continuously for the last month. Nice to see the whole family out for a stroll! Hi Rob, did you get it yet? Been having some trouble sending it, and might need to split it into two files. I'm downloading it now. Will let ya know more as I start to work with it. Don't worry about the Kongo - not important at all! "Holy S**T! That was fast!" Not QUITE yet. 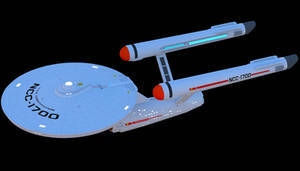 I have some people from the Trek Builders thread on the DAZ forums doing some unofficial beta testing for me. I think the .obj files "snap" to their places as they should. is essential, especially with the props of the various registries.